These tasty pickles were inspired by the banh mi, the traditional Vietnamese sandwich typically featuring grilled pork, fresh cilantro and jalapeño and crisp pickled daikon radish and carrots. 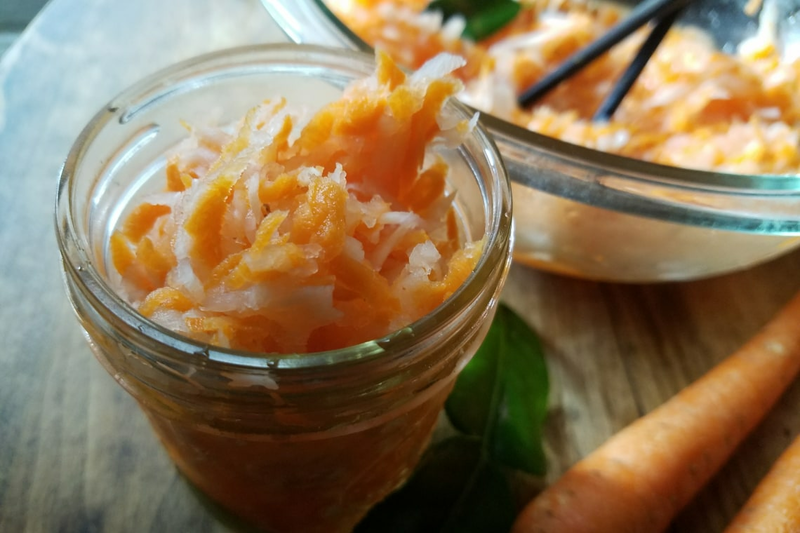 Keep the pickled carrots and daikon in the fridge to have on hand for making your own banh mi, topping salads, tacos, or serving alongside crispy tofu or grilled chicken and rice. These quick pickles (meaning they aren't canned) will keep in your refrigerator for up to one month. 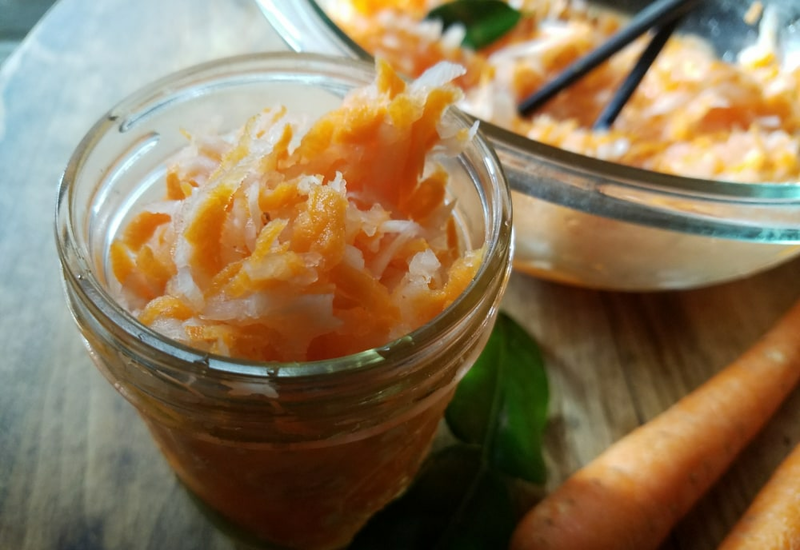 Easily shred the carrots and daikon using the grater tool on your food processor or a mandolin—no need to grate by hand! Fresh lime leaves can be found at many Asian or Latino markets or in well-stocked spice shops. As you master this recipe, feel free to experiment with different spices and seasonings. Try adding whole peppercorns, mustard seeds or fresh cilantro or dill. Per Serving: 10 calories; 0g fat; 2.2g carbohydrates; 0g protein; 0mg cholesterol; 95mg sodium. These pickled carrots and daikon were the perfect complement to the crispy tofu nuggets I made for dinner the other night. I love anything pickled, and this was no exception. So delicious and a ton of flavor! 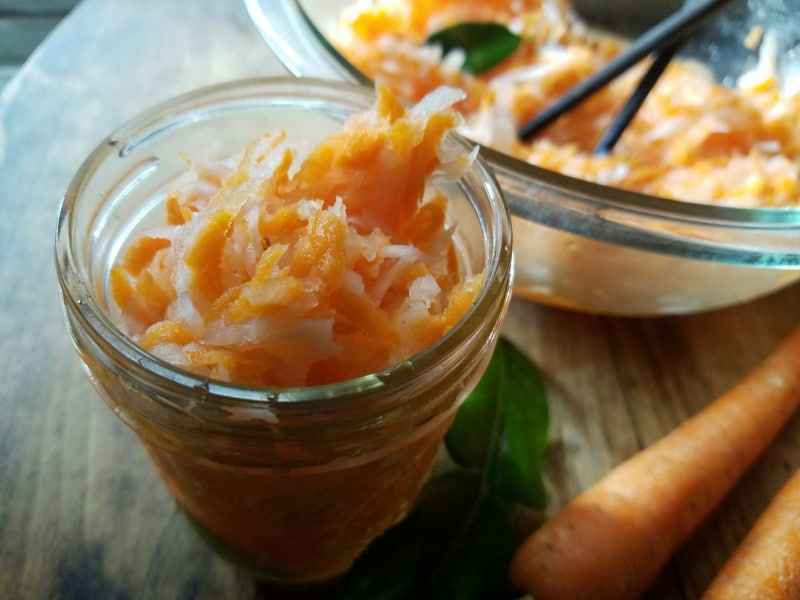 I recently got into canning, so this pickled carrots recipe was right up my alley. Simple, not a lot of fuss, and delicious afterwards.